Ambitious producer Irwin Allen made a series of Sci-fi fantasies at 20th Fox, none of which have held up as classic fare. 1960's The Lost World has a lousy reputation, Five Weeks in a Balloon is a real stinker and this juvenile deep-sea adventure never earned much respect either. But Voyage to the Bottom of the Sea possesses an indelible charm thanks to a goofy story and special effects both imaginative and colorful. With its incredibly cool submarine Seaview gliding under the surface of the ocean, the Fox Cinemascope production was the perfect air-conditioned popcorn picture for the summer of '61. Allen gave his name cast a soggy script to wade through, and a story riddled with logical and scientific holes. Ten year-old kids didn't mind a bit. The script by Charles Bennett and producer Allen takes the kitchen sink approach to underwater adventure. On its shakedown voyage, the U.S.O.S. Seaview, a super-scientific research ship (the kind with nuclear weapons) surfaces at the North Pole to discover that the Van Allen radiation belts have ignited. A sky full of flames is roasting the Earth below. The ship rushes to the United Nations in New York so that the Scientist/Admiral Harriman Nelson (Walter Pidgeon) and his cohort Commodore Lucius Emery (Peter Lorre) can present a radical solution: shoot a nuclear warhead into the belts and blast them away from the Earth. When the U.N. science chief (Henry Daniell) rejects the idea, Nelson undertakes to save the world on his own authority, with the world's navies in hot pursuit. The Seaview crosses half the globe as the temperature soars. Harriman battles sea monsters, pursuing submarines and a mutiny to make his deadline in the Marianas. For all of his shortcomings, Irwin Allen was an early proponent of upscale genre pictures, a gambit that became the norm after Star Wars almost two decades later. Voyage to the Bottom of the Sea pre-empted low-budget exploitation movies with a studio production boasting color, flashy special effects and star names well past their prime. Beginning with a Jules Verne / Captain Nemo rip-off title, the story invents a patently ludicrous end-of-the-world catastrophe. The futuristic Seaview was apparently designed by General Motors in Detroit, as it is a glass-bottomed (nosed, actually) excursion craft with late-fifties tail fins. The 'scientists' on board do double duty as war-capable Naval officers. The ship unaccountably carries an arsenal of nuclear missiles... in case The Bottom of the Sea won't talk, I suppose. Variety called the film a "a crescendo of mounting jeopardy", a fair description considering the way emergencies pile up, one after another. Peter Lorre all but throws his arms up in despair, howling, "Not an indescribable sea monster attack now ... we just escaped a nuclear sub attack!" In between crises, the on-board drama re-hashes a ten-cent version of The Caine Mutiny, with the Admiral accused of losing his marbles. 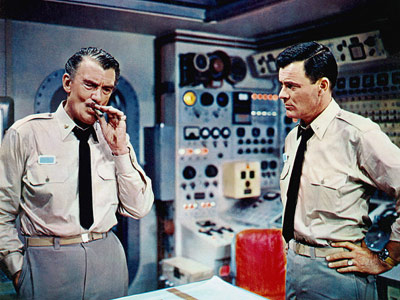 While the obnoxious psychiatrist (Joan Fontaine) offers a litany of ignorant, unsolicited opinions, ship's Captain Lee Crane (Robert Sterling) maintains a gotcha list on the Admiral's eccentricities and bad decisions, waiting for the right 'Strawberries Incident' to relieve him of his command. Somebody is messing with the nuclear reactor, setting staterooms on fire and rattling the Admiral so that he makes real mistakes, like cruising blindly into an underwater minefield. It's interesting that the sub has a picture-window front end, but with no lookout posted to watch where the boat is going. Allen's idea of directing is to line his cast across the wide screen, so they can listen to one character speak. Fussy Peter Lorre is wasted in a role that has him mumbling his dialogue while trying to elbow himself into other people' scenes. Barbara Eden serves coffee and struggles to pass through those raised port-ways in a skirt three sizes too small. Allen shows his opinion of her acting talent by saving his only non-eye level, non-boring interior shot for a CinemaScope close-up of her derrière gyrating to goldbrick Frankie Avalon's trumpet music. Eden's husband Michael Ansara wanders about cradling a puppy and mumbling deranged prophecies about the end of the world. The annoying TV announcer with the Jersey accent is none other than our producer Irwin, saving a buck. The sets look pretty cheap. The ship has a swimming pool for sharks on board even though the sub frequently cruises at a 30-degree down angle. The electronics in the bridge are just a lot of blinking lights, including the matter-transmitter from Fox's The Fly, inherited from Desk Set. Yes, it does shoot sparks while all hands lurch and stagger about, as if unaware that boats might pitch and roll. The crew must surely experience a little mal de mer whenever the Seaview does its show-off, give-everyone-the-bends crash surface maneuver, lurching a hundred feet into the air. L.B. Abbott's effects include some marvelous master shots of the sub cruising majestically under the fiery surface, and nearing the U.N. building on an East River roasting in temperatures upwards of 135° (it eventually gets to be 173°). Technicolor expert Winton Hoch also helped light the effects setups to get the beautiful color contrasts. According to his son, who I met and conversed with on a picket line, the big sub model had plenty of problems, the primary one being that the cool-looking manta ray- like 'wings' up front weren't particularly hydrodynamic. The sub had to be pulled on wires not to steer 'up' and as it filled with water it tended to list to port. It looks great anyway. The sub chase into the Mariana Trench isn't very convincing (Eiji Tsuburaya's implosion effect from Atragon is far better) but the scene in the minefield with the tiny mini-sub is rather well done. Unfortunately, the big climax is botched because the crucial missile launch is under-visualized. The movie ends far too abruptly. Fans of Voyage to the Bottom of the Sea laugh at its scientific bloopers. This is the movie where ICE SINKS, when the Seaview is pelted by falling chunks of glacier ice. The Van Allen belts are tiny particles way out in space, where there's no oxygen to let anything burn. On board the ship, Nelson orders the mini-sub into action because it's too deep for frogmen to work. Yet the mini-sub is an unpressurized vehicle in which the pilots must wear ordinary scuba gear. The crew's radiation warning badges are a real hoot -- by the time they glow red, the bearer has already received a lethal dose. 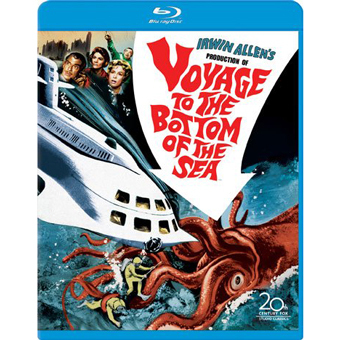 20th Century Fox Studio Classics' Blu-ray of Voyage to the Bottom of the Sea is a step up from previous DVD releases, with a far sharper and more stable image. Reds don't bloom. With the burning sky rippling reds and golds downward through the ocean's surface, those underwater scenes are real beauties. The extras are the full compliment arranged for Fox's DVD Global Warming Edition, now six years old. Paul Sawtell's lively music can be heard on an Isolated Score Track, along with Frankie Avalon singing the campy title tune. Author Tim Colliver's feature commentary is an uncritical super-fan affair that offers no context broader than the movie's paperback novelization. Colliver discusses the later TV show as well, again from the perspective of a fan convinced of their greatness. He likes to explain special effects in detail. I watched the TV series plenty as a kid but even then tended to zone out and simply wait for the recycled sub shots; the TV show's music score was impressive as well. Of course, there's always the old Mad Magazine spoof, entitled Voyage to See What's on The Bottom. I wish that were included here! The recycled featurette is Science Fiction: Fantasy to Reality, the first half of which gives a rather meandering view of the Sci-Fi movie genre. Comments by luminaries like Forrest Ackerman, Ray Harryhausen, et al., are surely culled from interviews on other subjects. We're shown an interesting selection of clips from the rare 1930 Fox musical Just Imagine. The featurette then settles into a cursory examination of the Global Warming phenomenon, shoe-horning in film clips from Voyage and The Day After Tomorrow. In another extra, Barbara Eden answers a long series of questions; she still looks perky enough to be a genie. Her nice-talk about her Voyage experience and her lunches with Lorre and Pidgeon isn't particularly deep: "They were so funny!" I remember reading my Dell movie comic of Voyage until the paper dried up. I had somehow missed the first release of the film and stared at the comic's representation of the submarine for hours on end. It was wide and had a full rear grille, like a Cadillac. It also battled a tentacled dragon, not a garden-variety octopus. Voyage to the Bottom of the Sea is a perfect juvenile undersea adventure. With two or three thousand minor changes, it really ought to be remade for today's kiddies. Movie: Good, if very juvenile. Supplements: Commentary, Isolated score track, featurette on Sci-fi and global warming, Barbara Eden interview, original trailer.